None of us can be safe until all of us are safe. I first heard this sentiment uttered by the Reverend Timothy Murphy on this episode of Code Switch. Code Switch Safety-Pin Solidarity: With Allies, Who Benefits? The Reverend Timothy Murphy doesn’t credit Martin Niemöller for the inspiration, but I know the origin of the sentiment all the same. The same feeling has been heavy on my mind since the day His Electoral Highness descended the golden escalator and intoned “Mexicans are rapists” to a rapt audience. 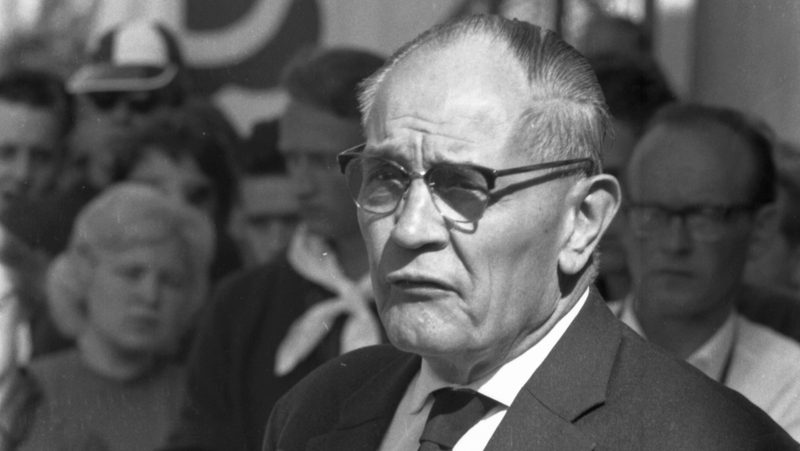 For those who are not students of history, this was Martin Niemöller. 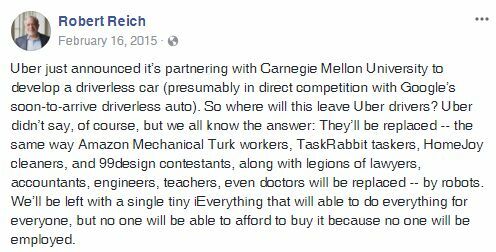 Uber just announced it’s partnering with Carnegie Mellon University to develop a driverless car (presumably in direct competition with Google’s soon-to-arrive driverless auto). So where will this leave Uber drivers? Uber didn’t say, of course, but we all know the answer: They’ll be replaced — the same way Amazon Mechanical Turk workers, TaskRabbit taskers, HomeJoy cleaners, and 99design contestants, along with legions of lawyers, accountants, engineers, teachers, even doctors will be replaced — by robots. We’ll be left with a single tiny iEverything that will able to do everything for everyone, but no one will be able to afford to buy it because no one will be employed. …which is why the need for [Universal Basic Income] for all of us to legitimately claim that we have the right to not be left to starve in the streets, is so important. This kind of anti-progress agitating is something that just sounds ignorant. Technology will not stop. Driverless cars will happen. Shovels made fewer diggers necessary, but that doesn’t mean we should hire an army of diggers equipped with spoons. It means that maybe no one likes to dig and we’d like to have a machine do it for us. But that also doesn’t mean that people who used to dig should simply roll over and die. Uber is just one ride-sharing app. There are several. I think writing laws to combat how Uber does business is essentially wasting time, because there really isn’t any functional way to stop people from ride-sharing. It’s going to happen, and some of those people will exchange cash for the ride. I really don’t care about what Uber says they are doing, when faced with a full-court press against them. I didn’t care what the music-sharing software companies said back when they were under attack. When that was the case, I observed that I didn’t think making music sharing illegal was going to stop music sharing. It didn’t. There is a serious vein of Luddite running along this anti-Uber rant I keep hearing. Which is why I pointed out that shovels put people out of work too. There needs to be a reality check involved when people start screaming about loosing their jobs. Loom workers and carriage makers lost their jobs too. Shall we de-automate that process? Go back to using horses? Seems silly to me. Uber is flouting public transport regulations, I can grant that as a premise with no qualms in hindsight. All of the new internet services disrupt the previous social structures in some significant ways. Music sharing sites destroyed corporate music systems as they existed previously. There is big money behind taxi medallion holders in NYC. I think that’s the only reason Uber is in the news at all. File sharing and corporate music was a similar situation, and the last thing we want is another DMCA that addresses cabbies. Crying for the poor taxi drivers is a front; because that’s not what it’s about. It is about gatekeepers and control, just like the music industry. There is far more music now, and better music, than there ever was when corporate gatekeepers had the lock on music. There are plenty of people (I’m one of them) who pay for things even though they don’t have to, because I know that rewarding effort is how you get more of the things you like. Robert Reich in this instance is fighting against the tide of history. It’s not been shown to be effective in any real way. One final word. You might be able to take down Uber because they are for-profit. You cannot and will not take down the next app because it will be a grinder-like app that allows people simply to offer and accept open seats in vehicles going where they are going. That is where the demand is, and where the supply is wasted. That trade will continue in the absence of Uber and other profit-making companies. …which is and was the point I’ve been trying to make. Facebook status and resulting argument summarized and backdated for the blog. UBI replaces “dole” in the original post. UBI is what I meant at the time but hadn’t stumbled across that concept then, or hadn’t applied that label to the concept. This is a blog entry I’ve been threatening my brother with for a long time. I just can’t put it off any longer though, not with The Stones playing in town tonight; and opening for The Stones (perhaps the oldest and still most popular rock band actively touring these days) one of the newest bands to hit the charts, Los Lonely Boys. Last week they were featured at Austin City Limits Festival, and this week they are opening for The Stones. They’ve hit the big time, these three guys from San Angelo, thanks in no small part to my brother. There was a little place in San Angelo called the Steel Penny Pub, one of the few places in that town where you could go to get good cold beer and great live music. My brother opened the venue with the intention of creating a place for his band Hazytrane to play, only to discover that the demands of owning a business took up too much time for him to continue pursuing his own musical career. Not too long after starting the Pub, his band folded up and went their separate ways. The lead guitarist became a lawyer. I still can’t wrap my head around that transition. What he did instead of featuring his own band was to look around for another house band to fill the void that was left where his band used to be. What he found was Los Lonely Boys. Even though (as this article notes) they were underage at the time, Russ gave the boys the job, and they honed their already impressive skills playing several nights a week at the pub. I would really like to say “I heard Los Lonely Boys at the Steel Penny Pub” but I was a professional architect working in another town, and I didn’t have time to fool around with music in those days. Somehow I managed to miss all of their performances there. Luckily for them, Willie Nelson didn’t. While in town for a show of his own, Willie stopped by the Pub and heard Los Lonely Boys for the first time, and recognized their talent right away. Within a few months they were playing at festivals and concerts alongside Willie Nelson, and not too long after that their first album debuted. …And the rest is history. Heaven (not my favorite song on the album, but definitely a very catchy tune) reached the top ten, and stayed there for 18 weeks. My brother handed over management of the Pub to his business partner, and went on the road with Los Lonely Boys as their road manager for nearly two years. It was quite a ride. I finally got to see & hear Los Lonely Boys play at Antones here in Austin, early in their first tour. I’ve never seen anybody play guitar like these guys can. If you get a chance to see them live, you’ll kick yourself later if you don’t take the time to go see them play. Live is the way to experience most music; and live is without a doubt the best way to experience Los Lonely Boys music. You just won’t know what it’s really like until then. The last time I saw them was in the largest ever attending crowd (30,00 plus) for the Town Lake summer concert, which they turned into a concert video. And now they are opening for The Stones tonight. I know where my brother is going to be. Wouldn’t mind being in his shoes tonight, not one bit. A day… That won’t be my son’s birthday! We had originally been told that this would be pumpkin boy’s birthday. It may have been this information that inspired the early arrival, at least according to The Wife. Not having to share a day with Pearl Harbor day. Like my father’s beef with being born on September 11th these days. It’s probably better to be born on Halloween, if you look at it in hindsight. Author ranthonysteelePosted on December 7, 2005 February 16, 2019 Categories UncategorizedTags BirthdayLeave a comment on A day… That won’t be my son’s birthday!